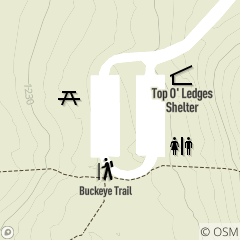 Top O' Ledges Picnic Area is located off Top O' Ledges Drive in Hinckley Reservation, off Bellus Road, east of State Road in Hinckley Township. Come outside and join us for climbing fun that will drive you up the wall. Understand the skills and systems needed for basic anchor building concepts. All the basic skills you need to get out there... climb smart, climb high and climb safe.